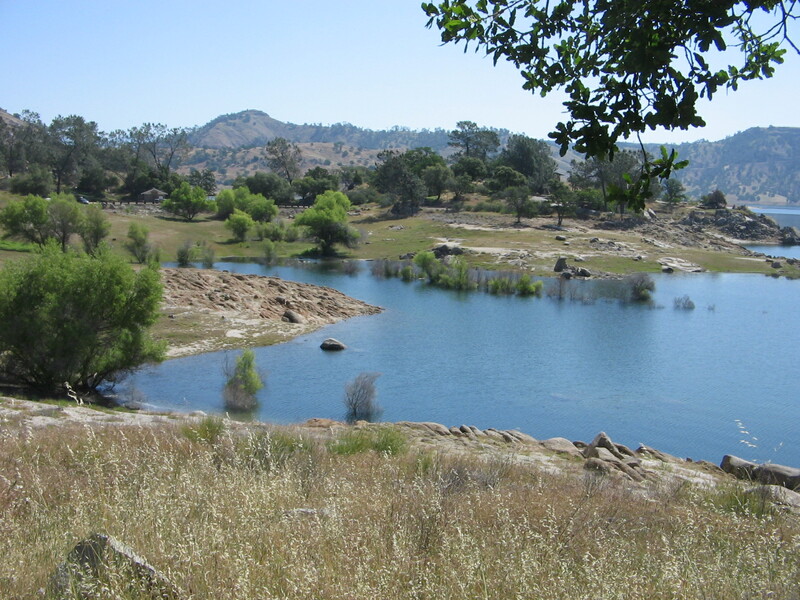 In contrast to our windblown camping experience last weekend, the weather for the two days we camped at Millerton Lake State Park was absolutely perfect. Added to that was the beauty of the area. Gaviota, being the first time I’d camped in a California state park, had not left me with a very good impression of state parks in California. 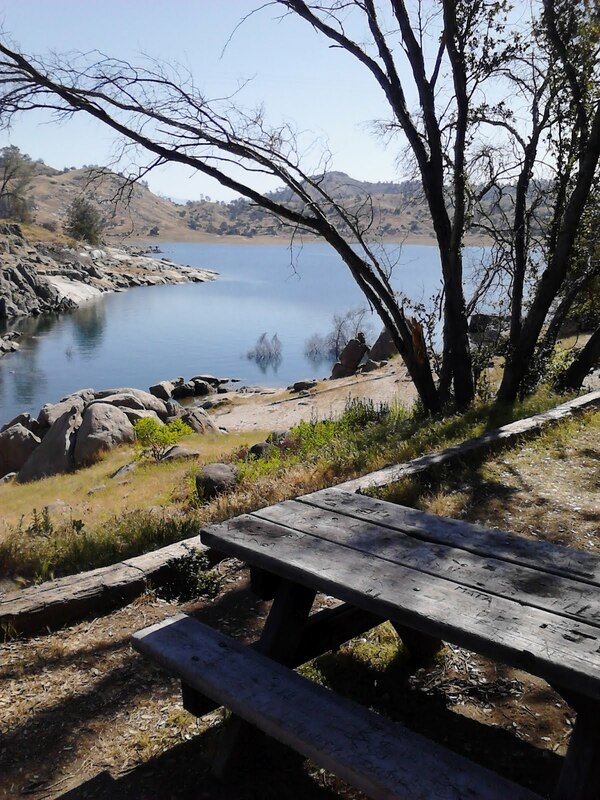 But Millerton Lake changed that and I would rate it as one of the best places we’ve camped so far. 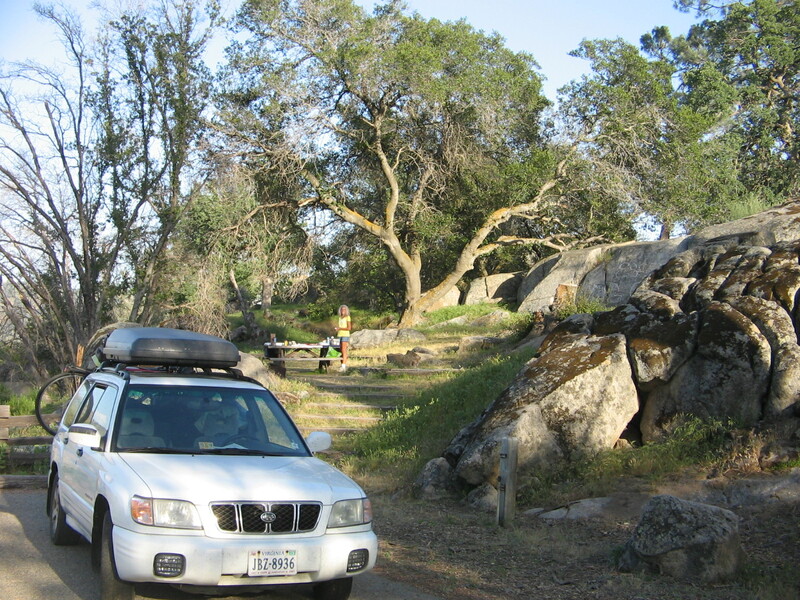 Our campsite at Millerton Lake. View of the cove from our campsite. Driving in on the road to the campground. We were on the Rocky Point loop, which is the point of land visible across the water. 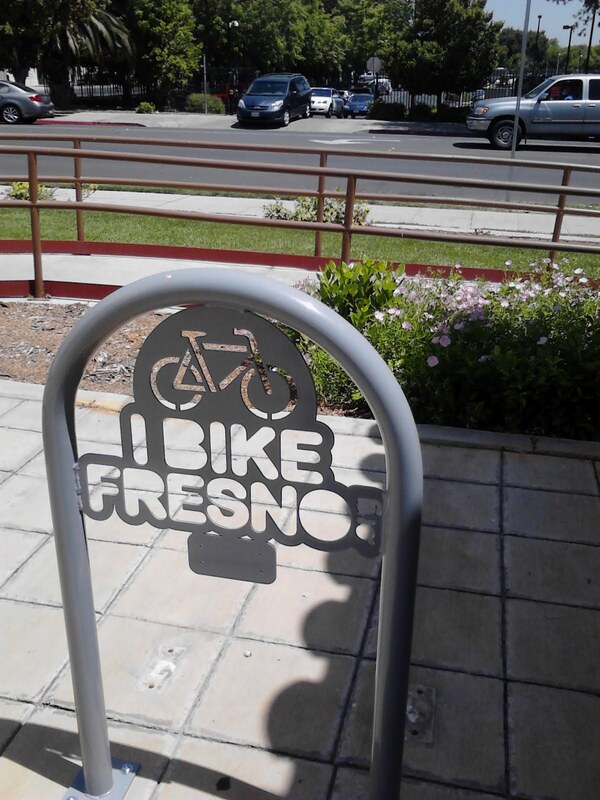 Most of our two days camped at Millerton were spent exploring the nearby city of Fresno, California. 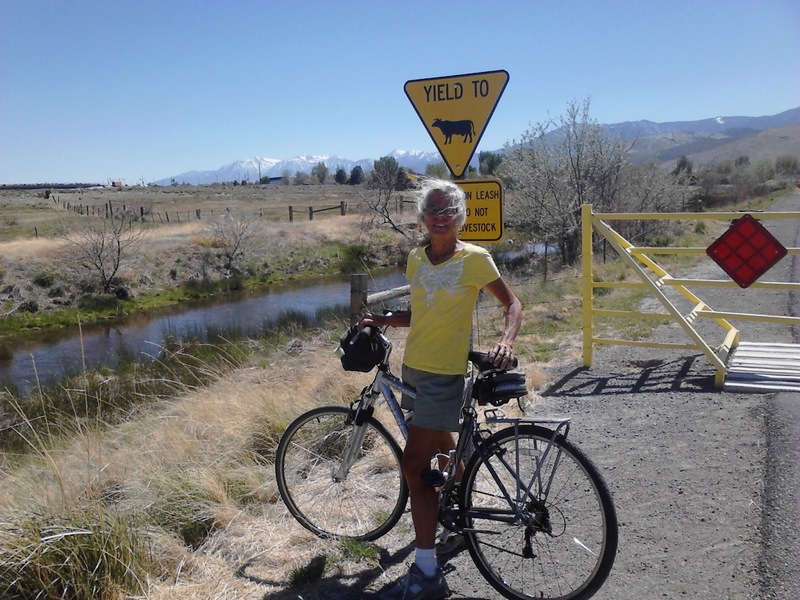 We took a couple of bike rides, and found the city to be bike friendly. 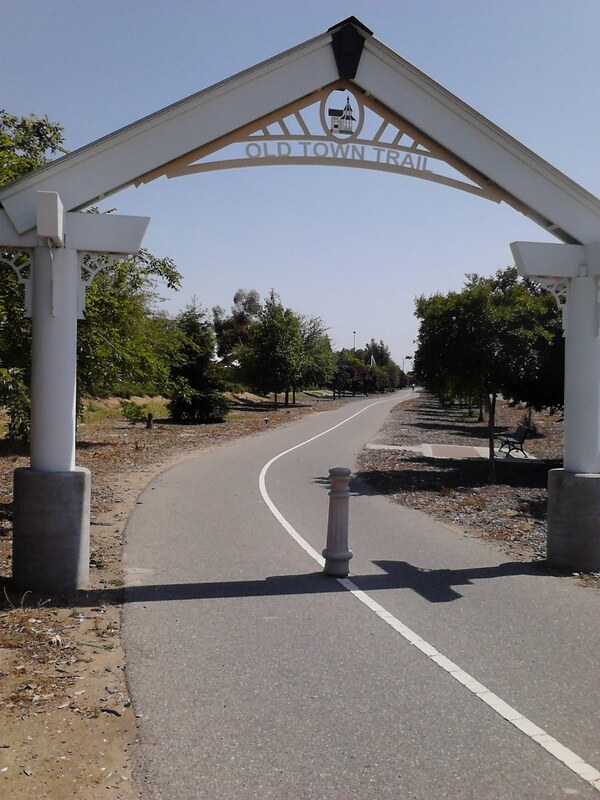 One of the bike trails, a rails-to-trails route called the Clovis Old Town Trail, went into the nearby town of Clovis. 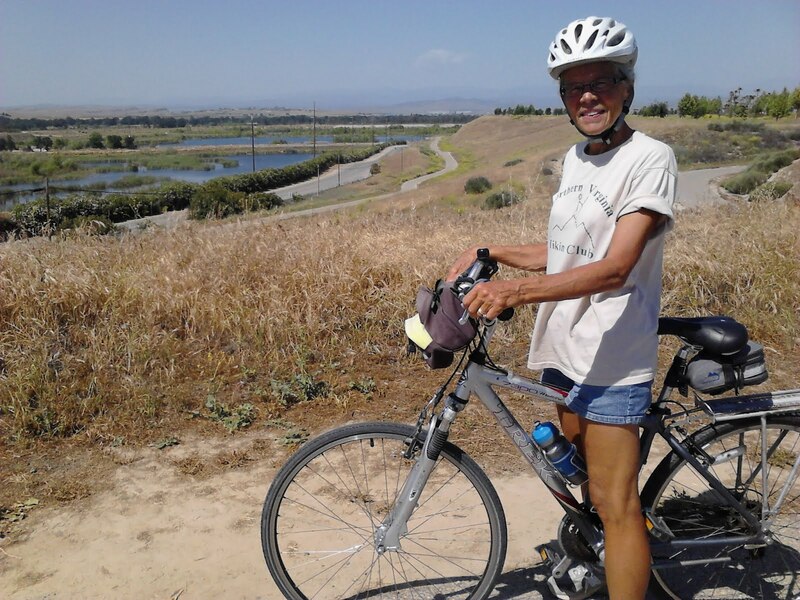 The second day we rode on a bike path that paralleled the San Joaquin River. Tuesday as we left Millerton Lake our plan was to drive north through Yosemite National Park and then camp in one of the state parks on the east side of the Sierra Nevada mountains. It would have been nice to have had time to hike a short trail in Yosemite but it didn’t work out that way. 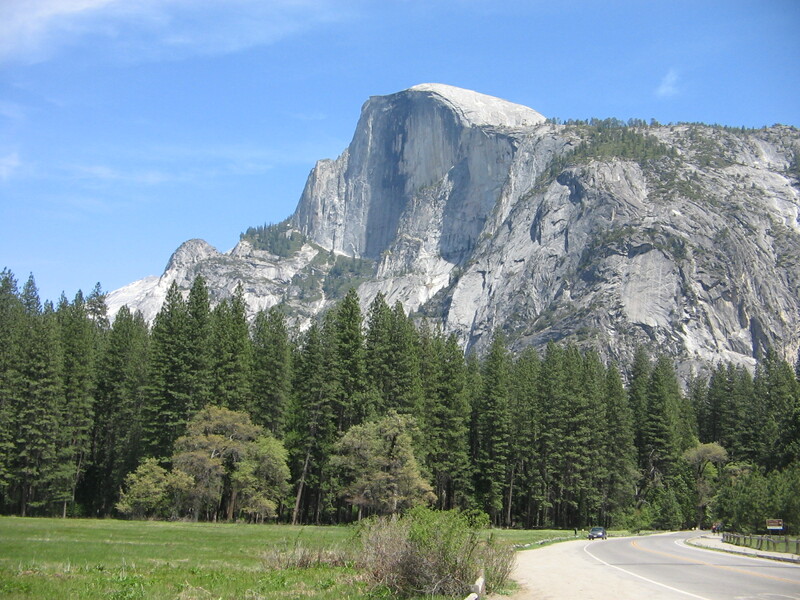 It was slow going driving up the winding road that leads into the park and then to Yosemite Valley. Once we entered the valley we were so overwhelmed by the beauty at every turn in the road that we couldn’t help but stop the car to gaze up at the towering granite cliffs and cascading waterfalls. As usual, when we experience such awesome displays of nature, we want to try and capture it in photos to share with everyone. It’s always “Oh, wait, stop, I need to get a picture here!” But hours later we look through the pictures and it just doesn’t do justice to what we saw. I think we were especially blessed to visit Yosemite when we did. At this time of year the snow is melting and the waterfalls are at their peak of glorious, shimmering flow. Tunnel View (named this because it’s what you see after driving through a tunnel on the road into Yosemite Valley). It was the first view of the valley and it took my breath away it was so beautiful. 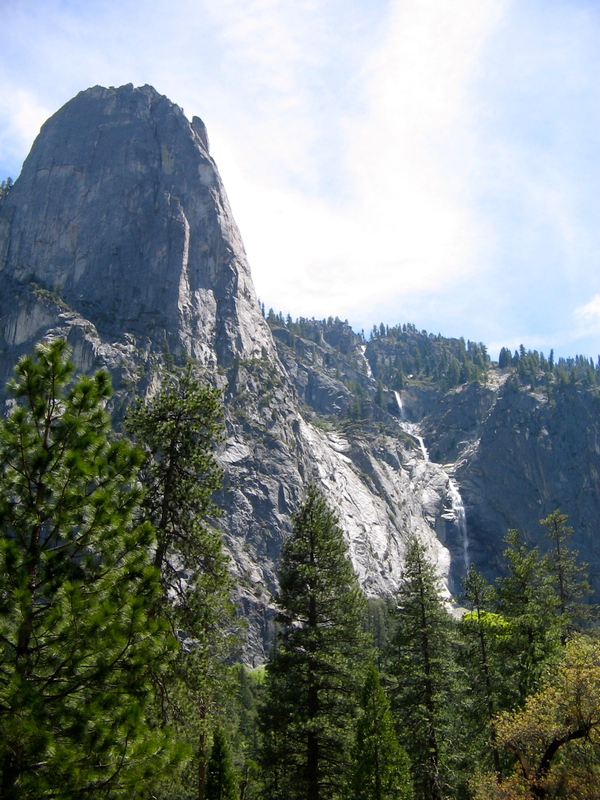 Bridalveil Falls is the waterfall in the distance. 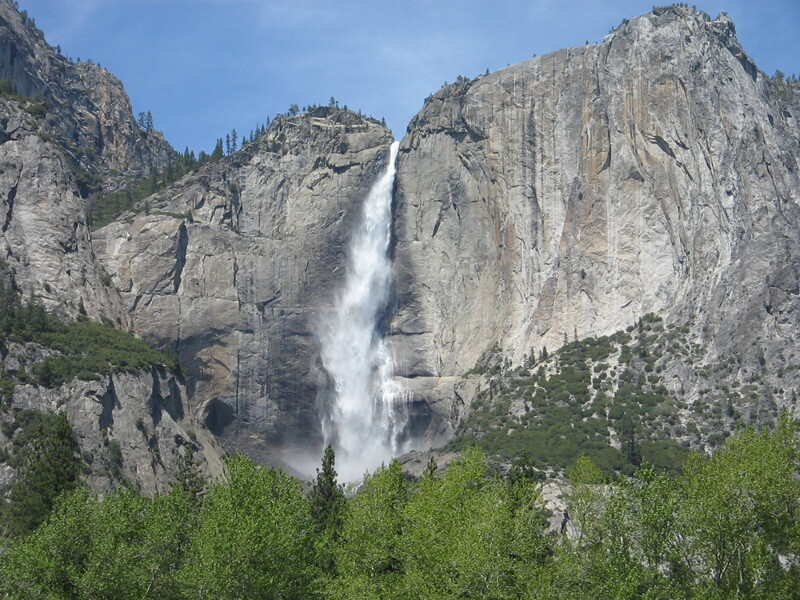 Yosemite Falls–highest waterfall in the US. No photo can capture the immensity and elegance of the shimmering, ever-changing cascade of water. I could have stood there and watched for hours. 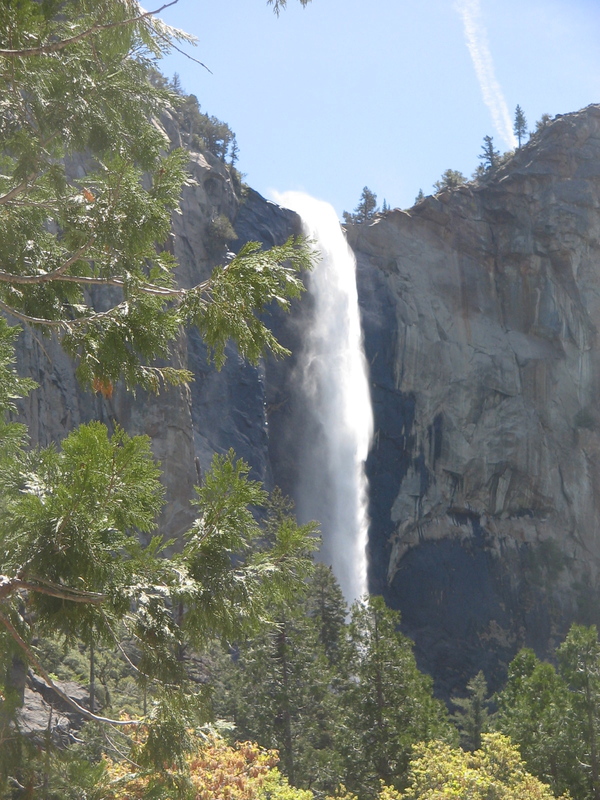 As we drove out the other side of Yosemite Park we could see why the waterfalls were so full. 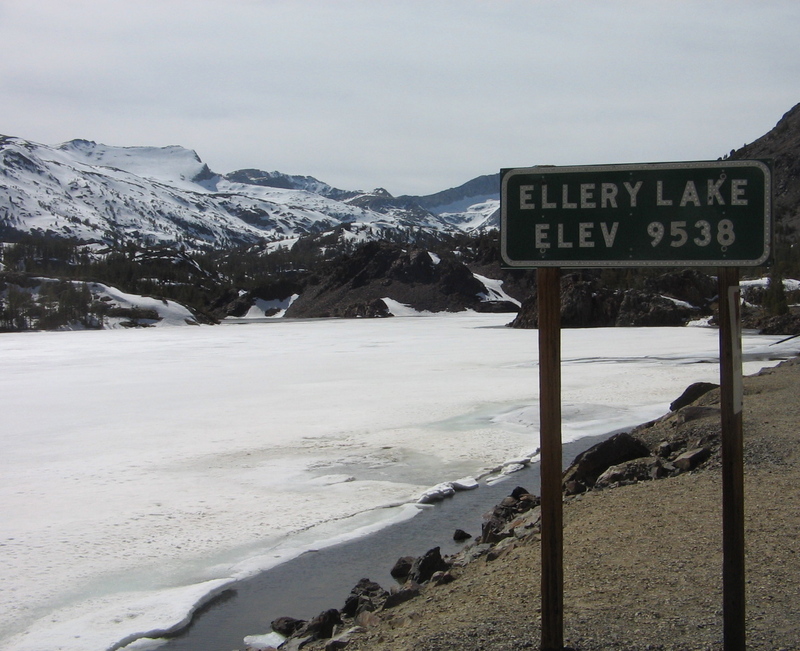 The Tioga Road that crosses the northern part of the park is closed November through May because that’s where all the winter snows accumulate. It was obvious as we approached the 8,000 and 9,000 foot elevations that there had been a lot of snow this year, some of it melted but lots more still to melt. Roadside view driving down the eastern side of the Sierra Nevada’s, leaving Yosemite Park on Tioga Road. Winter hasn’t left here yet. 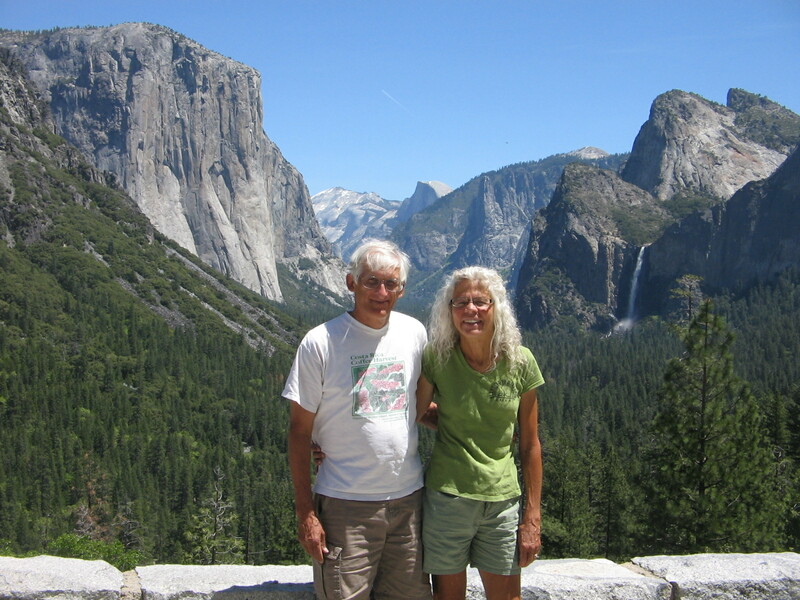 Whereas I would have been happy to spend many more hours in Yosemite Valley, I couldn’t wait for us to get back down from the steep mountains on the eastern side of the park. It wasn’t just the cold air up there that bothered me. It was also the fact that our car had been making an alarming, grinding noise all day and the more we drove it the worse the noise became. Lee said he was fairly sure that it was the wheel bearings. As we rounded steep, downhill curves with no guard rails and I peered over the edge I shuddered to imagine us driving along that road and having a wheel fall off the car! Because of the mechanical issues with the car, we decided to forgo camping and head for the nearest town that would have auto shops. There aren’t any sizable towns in that part of the country so it meant driving into Carson City, Nevada. We had intended to go there, anyway–it’s just that now we arrived a day earlier. It made for a long day of driving but the car got us there without breaking down. We just “happened” (I’m sure God’s provision was in there somewhere) to find a motel as we came into town that was right across the street from the Subaru dealer. The service shop at the dealership was able to work on the car first thing this morning and had it done by early afternoon. We are now spending our second night in the Carson City motel and will continue our journey tomorrow. 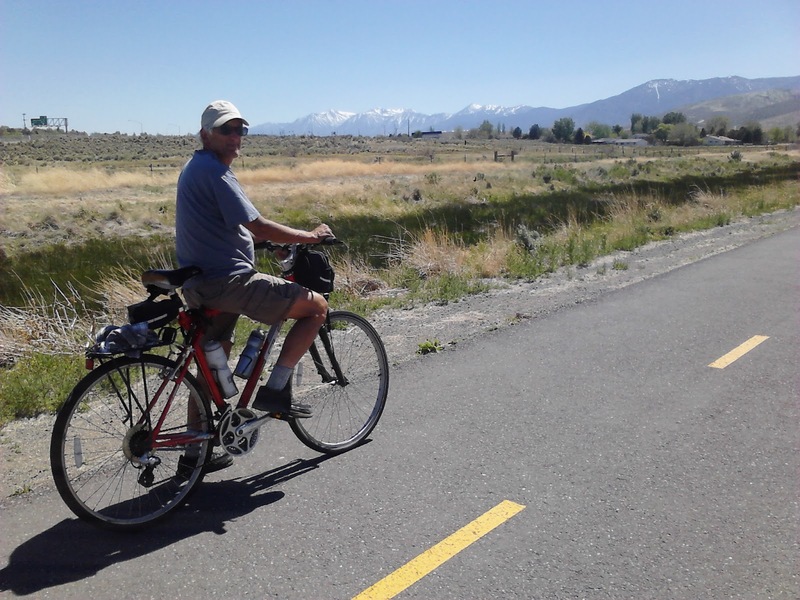 Bike riding in Carson City, Nevada, while waiting for our car to get fixed. Just sent Meg the link for your blog and will tell her how to comment using ANON. You really are taking in an unbelievable taste of our beautiful country and writing such informative blogs. Keep up the good work. I hope you don't experience any more car trouble.